It’s hard to imagine that a facade like this can create such an uproar amongst architects and designers (I know a lot of you might think it is ugly). 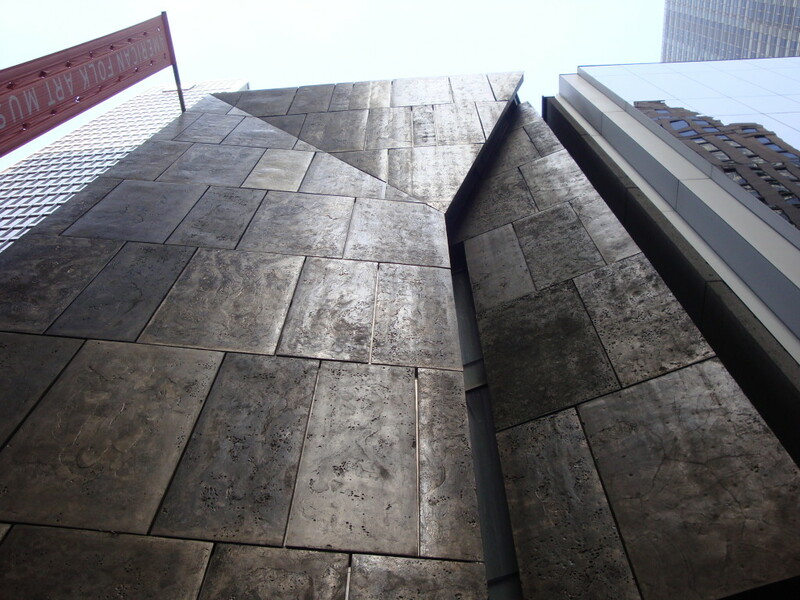 I too am going to miss this distinctly tactile, brutal facade of the American Folk Art Museum in New York, if MOMA has its expansionist ways ( click to read the latest opinion in the NYTimes). Why am I upset? First, museums, companies and individuals currently favor buildings with open, glass facades. This aesthetic choice expresses an intellect of reasoning, a view that modernism is our future. In abundance it is also boring. There’s too much uniformity, and this facade designed by Tod Williams and Billie Tsien is different. It’s about making a bold statement on the street, allowing light to filter in through slits, and it has a material quality and uniqueness which was perfectly suited for the “folk art” museum it once held. Traveling through Israel and France this past summer, I marveled at the contemporary architecture which I saw, which was new and did not follow trends. Certainly there are precedents, but I did not repeatedly see the same shapes, the same styles…and not everything had a glass facade. This is a plea for expressing ones personality, ones uniqueness. Times change, buildings get new owners, buildings get torn down. MOMA has every right to do what it wants. I just hope that the outcome, by Diller Scofidio & Renfro, a firm which I also admire very much, reverses the “corporate” dead-feeling that was created with the last remodel a decade ago by the Japanese architect Yoshio Taniguchi. Modern art, when it was first coming in to it’s own, was shocking. It was different. It offended, or at least made people think. Hopefully, even if this facade does get torn down, the new addition will go some way towards re-establishing thought (into the architecture) at MOMA.